Bangladesh's democratic government has taken a series of steps to stem the tide of Islamic extremism since it won elections in December 2008. Most of the actions by Prime Minister Sheikh Hasina and her party, the Awami League, target the radical Jamaat-e-Islami, a Pakistani-tied Islamist party which seeks to impose Sharia law in Bangladesh. Four senior Jamaat-e-Islami (JI) leaders, including the party's leader Maulana Motiur Rahman Nizami, were arrested in July in connection with mass killings and other war crimes committed during the 1971 war of independence from Pakistan. The four reportedly led Islamist militias targeting pro-independence supporters and religious minorities. Bangladeshi sources claim the Pakistani army, with the aid of local collaborators, killed as many as 3 million people during the nine-month war that ended with the surrender of the Pakistani army and Bangladesh's emergence as an independent nation. A recent ban was imposed on books by Islamist scholar Maulana Syed Abdul Ala Maududi in mosques and libraries across Bangladesh. Maududi founded the Jamaat-e-Islami (JI) party in 1941 in Lahore, Pakistan, then part of British India. He is a leading pioneer of Islamic revivalism in South Asia and has been reported to be inspired by the Ikhwan al-Muslimeen or the Muslim Brotherhood, a global Islamic revivalist movement founded in Egypt in 1928 that seeks to establish a worldwide caliphate based on Islamic law. In one of those books, Let us be Muslim, Maududi preached that Muslims "must strive to change the wrong basis of government, and seize all powers to rule and make laws from those who do not fear God." Bangladesh's Supreme Court delivered a landmark verdict in July overturning a 1979 constitutional amendment legitimizing military rule and sanctioning the participation of religious parties in politics. "Secularism will again be the cornerstone of our constitution," said law minister Shafiq Ahmed. "Islamic parties cannot use religion in politics anymore." The country's highest court also ruled the use of religious fatwas to mete punishment "illegal and without legal authority." Earlier this year, police arrested Mohiuddin Ahmed and Syed Golam Mawla, top leaders of Hizb ut-Tahrir, a global Islamist movement that seeks to establish a worldwide Islamist caliphate ruled by Sharia. Both Ahmed and Mawla are professors at the prestigious Dhaka University and Ahmed is the chief coordinator of HuT in Bangladesh. The arrests followed the government's ban of the HuT in October last year. Bangladesh—a nation with 140 million Muslims—is in the midst of waging a critical battle with Islamist terrorism. Absence of the rule of law, poverty and rampant corruption have made the country a safe haven for Islamic terrorist groups, including the Jamaat ul Mujahedin Bangladesh (JMB), Jagrata Muslim Janata Bangladesh (JMJB), and Al Qaida-affiliated groups such as Harkat ul-Jihad-i-Islami-Bangladesh (HuJI-B), Jaish-e-Mohammad (JeM), and Lashkar-e-Tayibba (LeT). The crackdown carries significant risks, Bangladeshi writer Jamal Hasan said in an interview with the Investigative Project on Terrorism. "There is a rising possibility of the ruling government heading for a violent confrontation with Islamist forces," he said. Hasan urged the U.S. to bolster its "intelligence sharing and counterterrorism operations" with the Bangladeshi government to avoid such a reaction. Jamaat Support Base in the U.S. The Islamist JI party has a strong support base in the U.S. 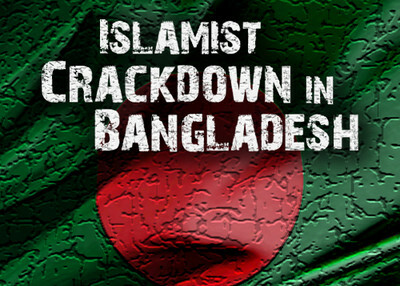 The Muslim American Society (MAS), an organization with strong ties to the Muslim Brotherhood headquartered in Alexandria, Va., issued a press release that condemned the July arrests and "expressed grave concern over the human rights conditions in Bangladesh." It blasted the moves as "oppression of religious elements" and accused the democratically-elected government of a "descent into authoritarianism." Another important supporter of the JI in the U.S. is the Islamic Circle of North America (ICNA). An article in the October 1996 issue of ICNA's publication The Message [International], supports the JI and its founder Maududi: "Using the organizational development methodology of [JI founder] Maulana Maududi and the Jamaat Al-Islami of Pakistan, which lays special emphasis on spiritual development, ICNA has developed a strong foundation." ICNA also promotes Maududi's books in the U.S. ICNA members have also been reported to be linked to individuals involved in war crimes perpetrated during Bangladesh's 1971 War of Independence. Shaikh Muhammad Yusuf Islahi, a member of Jamaat's branch in India (Jamaat-e-Islami Hind) is a Chief Patron of ICNA's dawah or proselytizing project, WhyIslam, and was a featured speaker at the 34th ICNA-MAS convention in Hartford, Connecticut, in 2009. Bangladesh is slowly becoming an attractive haven for international terrorist groups, including Al Qaida. Pakistani groups such as the Lashkar-e-Tayyiba (LeT) and Jaish-e-Mohammad (JeM) that are affiliated with Al Qaida reportedly have a presence in the country. Three Lashkar operatives were arrested last year from a madrassa in Chittagong, Bangladesh's main seaport and second-largest city. Rogue elements from within Pakistan's intelligence agency reportedly provided the support structure for Lashkar and other terror groups to operate in Bangladesh. Following increased security and counter-terrorist operations in Southeast Asia, Jemaah Islamiya leader and alleged mastermind of the 2002 Bali bombings that killed 202 people, Hambali, planned on shifting his operatives to Bangladesh. In fact Hambali was on his way to Bangladesh when he was arrested in Thailand in August 2003. Despite the crackdown, the government still faces challenges from Islamic radicals and violent extremists seeking to destabilize the country's democratic institutions and establish Sharia law. The former government of the Bangladesh National Party (BNP) included Islamist parties such as the Jamaat-e-Islami (JI) and the Islami Oikya Jote ("Islamic Unity Front"). This situation helped expand the influence of Islamic radicals in Bangladesh and created space for terrorist groups to operate in the country with relative impunity. The Islami Oikya Jote is alleged to have ties to the extremist HuJI-B, a group on the U.S. State Department's list of terrorist organizations. HuJI-B was founded in 1992 by Bangladeshi mujahedin returning from Afghanistan reportedly with assistance from Osama bin Laden. The organization is a signatory to bin Laden's 1998 fatwa that declared holy war against America and her allies. The group is also tied to the January 2002 attack on the American Center in Calcutta. JI, the other coalition partner in the former BNP coalition government, has ties to the radical extremist group Jamaat ul Mujahedin Bangladesh (JMB) that seeks to establish a Taliban-style government in Bangladesh and is believed to be behind the spate of bombings across Bangladesh in 2005 that targeted high-profile judges, journalists, and politicians. Foreign-linked Islamist charities play a significant role in financing religious extremism in Bangladesh. After the August 2005 terrorist bombings, Bangladeshi intelligence agencies issued a report accusing Mideast-based NGOs operating in the country of funneling cash to extremist groups. The report exposed a "deep-rooted" nexus between the charities and leaders of the JI and the Islami Oikya Jote. Five foreign officials working for the charity Revival of the Islamic Heritage Society (RIHS) were deported from the country following the August attacks. Before joining the RIHS, the five had worked for Al-Haramain Islamic Foundation (AIF) in Bangladesh, a U.S.-designated Saudi charity linked to Al Qaida. In April 2006, the Central Bank of Bangladesh fined Islami Bank, the country's largest Sharia lender, for violating anti-money laundering laws by wiring funds to extremists. There has been an explosive growth of madrassas (religious Islamic schools) in the country, several reportedly funded by Saudi charities. Madrassas have been known to provide weapons training in some remote parts of the country. The Chittagong Hill Tracts region of Bangladesh, for instance, is notorious for its radical madrassas and HuJI-B is alleged to run several training camps in the region. It has also been reported that a staggeringly high proportion of army recruits come from madrassas, resulting in deepening Islamist penetration within the ranks of the Bangladeshi army. There is growing concern in the United States over the threat from Islamic radicals and violent terrorist groups in Bangladesh, several of whom have ties to Al Qaida. The U.S. Department of State Country Reports on Terrorism released last month noted the rise of radical Islamist activity in Bangladesh and said that groups such as the JMB, HuJI-B, and LeT continued to pose a threat to security in the region. U.S. and Bangladeshi law enforcement agencies have worked together in recent years on a number of cases related to domestic and international terrorism. The U.S. has also assisted Bangladesh to strengthen control of its borders, the State Department report said. The United States also started human rights training for Bangladesh's lead counterterrorism unit, the Rapid Action Battalion. In addition to direct assistance to anti-terrorism programs, education reform, including better oversight of Bangladesh's madrassas that serve as breeding grounds for radical Islamic extremism, must be a key U.S. priority. Washington must urge Dhaka to enact legislation that would "require financial transparency, curriculum reform, and compulsory registration of all madrassas," Hasan told the IPT. Let religion stay home not in the public place. This is impossible when you are a devout follower of a religion which prescribes how to live and act on a 24x365 basis. first underlined part concludes that BD govt. is taking steps. Against what? islamic extremists. Who are they? according to your post, it is Jamaat-e-Islami. As a citizen of Bangladesh, I have to disagree with you on this point. The govt. of BD is yet to declear them as extremist, nor any Legal authorities of BD. Then how could you reach such a conclusion? You also said, Jamaat-e-islami is also tied with Pakistani tied islamic party. Before 1971, they were a eastern part of Jamaat-e-islam, pakistan. this was because the then bangladesh was part of pakistan. after independence in 1971, Jamaat-e-islami was seperated from its pakistani tie and it was named as Jamaat-e-islami , Bangladesh. recently, it renamed itself Bangladesh Jamaat-e-islami to comply with BD's election commission verdict. My question to you, did you studies those facts before writing this post or reaching such a conclusion? Bangladesh Jamaat-e-islami never seeks to implement sharia law in Bangladesh. please read their party constitution and watch the local media to see thier commitment to Bangladeh's constitution. please be responsible while writing. another issue. BD govt. is taking steps against Jamaat-e-islami leaders. it doesn't imply that they are extremist. BD govt is acting on a case of war crime. i guess, war crime and extremism are different issues. thanks. keep writing and take responsibility of what you write. 1) A true secular Muslim country to supercede Turkey. Let religion stay home not in the public place. 2) Harmony among all Non-Resident Bangladeshis (NRB) for the better future of the country they love. Humans were born before religions and sectarian violence for the sake of religion cannot bring opiece and prosperity. 3) Bengali culture and language (Nazrul/Tagore) in the world body. India or West Bangal cannot do it because Indian official language is Hindi. 4) Strong socio-economic ties with India and other neighbors for its growth where millions are suffering. 5) Strong ties with USA to curb terrorism inside and across India border. US is trying hard to cooperate with a country like Bangladesh for a roll model. If not I see the bleak future of Bangladesh. It may be second Afghanistan. Better learn a lesson what Pakistan got in last 65 years not following secularism and democracy and what India got.